KUALA LUMPUR: BMW Malaysia Sdn Bhd has introduced a second body variant of the third generation MINI, the new MINI Cooper S 5-Door. The latest MINI is represented as the first-ever five-door model in the small car segment. 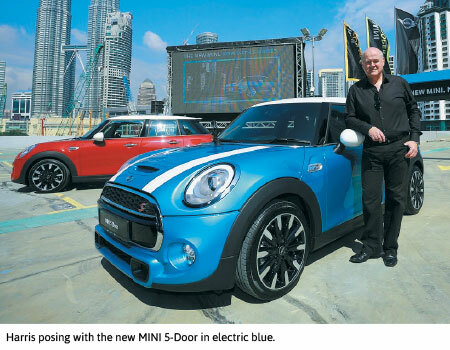 BMW Group Malaysia managing director Alan Harris said the new MINI 5-Door will appeal to Malaysians who are looking for a unique, one-of-a-kind car in their driveway. “MINI is the most unconventional premium small car brand in the world and the new MINI 5-Door will enable fans who grew up with the MINI brand and its iconic appeal to continue to grow with MINI even into a new generation,” he said in a statement yesterday. “The new MINI 5-Door is the perfect car for the small urban, modern Malaysian family for everyday use. Be it as a daily commute to work after dropping the kids off at school or the weekend out with family and friends. The only difference now is that you will be driving and travelling in style,” he said. Its estimated retail price is at RM238,888 on the road for personal registration, without insurance. The new MINI 5-Door offers a 2.0-litre MINI TwinPower Turbo Technology petrol engine, which delivers a maximum output of 141kW/192hp and 280Nm of torque. Coupled with a six-speed automatic sport transmission, the new model accelerates from 0 to 100km/h in just 6.8 seconds with a top speed of 230km/h. “These figures are combined with an average fuel consumption reading of 5.5 litres per 100km with C02 emissions level reading of 129g/km,” said BMW Group Malaysia. The new MINI 5-Door will be available in all authorised MINI dealerships nationwide from Saturday, offering 11 exterior paint shades.